Queen Rania attends Child Survival Symposium in the U.S.
Queen Rania on urgency of MDG 4: "We have the resources to save children's lives- and we will choose to use them"
(Office of Her Majesty, Press Department - New York) At the turn of the century, world leaders came together to outline the most pressing needs and obstacles to be addressed and set a deadline for tackling them. They called these the Millennium Development Goals (MDGs) and the deadline for achieving them is 2015. As we approach 2015, many countries are on track to meet those deadlines, but most underdeveloped nations still have a long way to go. 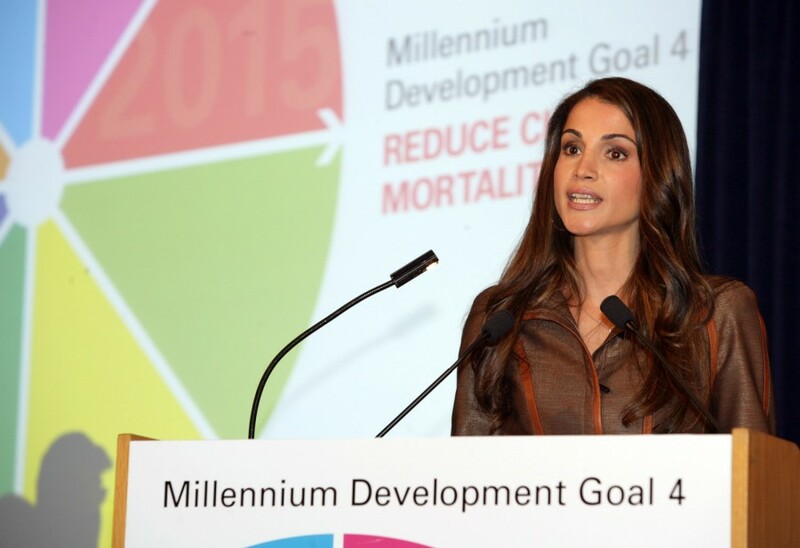 Today, in New York City, Her Majesty Queen Rania Al-Abdullah spoke at the Child Survival Symposium about the importance of MDG 4 which aims to reduce child mortality by two thirds. "I feel a sense of urgency when it comes to MDG 4," she said, "[because] none of our children can be secure in a world where millions of children are at risk." Queen Rania spoke of the many child safety programs and providers that she supported over the past year including a hospital in India where she administered vaccines to new born babies and a maternity ward in South Africa where doctors had developed a low-cost approach to incubation. Her Majesty highlighted the plight of Lebanese children this summer: "I think of what children in Lebanon endured this summer in a war that claimed over three hundred of their lives. A war that turned their playgrounds into battlegrounds, and classrooms, they thought they had left behind for the summer, into makeshift bedrooms." The statistics Her Majesty cited were staggering. "Four million newborns worldwide die in the first month of life – a number equivalent to all the babies born in the United States each year. And I think of how the accident of where they are born determines their chance to survive." "With MDG 4, the world has declared we will move from chance to choice. We have the resources to save children's lives- and we will choose to use them," she said. Because of each country's specific resources and needs, the Millennium Project has outlined key recommendations and has left it up to each nation to coordinate with various entities, public and private organizations on how to best achieve the goals. As a Board Member of the GAVI (Global Alliance for Vaccines and Immunization) Fund, Queen Rania stressed the role of vaccines and immunization efforts in protecting children against deadly diseases. "By catalyzing funding and creative collaboration— among governments, NGOs, pharmaceutical companies, and international organizations— GAVI’s efforts have provided well over 100 million more children with protection against deadly diseases, saving 1.7 million lives in the last five years alone and spurring development of new vaccines." Jordan has already made significant strides in tackling the problem of child mortality by opening new mother and child centers, carrying out inoculation programs against infectious diseases such as measles, hepatitis and tetanus, in addition to conducting awareness campaigns and sponsoring school health programs. Her Majesty cited a joint study by UNICEF and the World Health Organization which found that for $1 billion per year, ten million additional lives could be saved through maternal immunization between now and 2015. "Frankly, [this] is an investment that we cannot afford to ignore because the very nature of infectious disease in our interconnected world puts not only innocent children at risk, but their communities, their countries and well beyond," she said. "Surely, one billion dollars to save ten million lives is a price tag we can afford." "We can make child survival a reality- not just for babies born to loving arms and stable homes, but for babies born 'in places where we would not be caught dead'. And, maybe, one of those precious children will become the next Louis Pasteur—the child who uses his or her life to better the lives of us all". After the opening remarks by Her Majesty and other distinguished leaders, a panel of health experts debated various methods of achieving MDG 4. The one-day symposium was hosted by UNICEF, the Government of Norway and the medical magazine, The Lancet. The Lancet released a special electronic issue tracking the progress of 60 countries towards MDG 4 and UNICEF/WHO issued a new report on Pneumonia: the Forgotten Killer of Children.